Shanghai Daily recommends an outing to the hills around the West Lake, where both Buddhism and Taoism religions established themselves, and take a spiritual journey. Hangzhou has always been an important city in spreading the word of Buddhism in China. It is believed the Indian monk Huili, who arrived in the city in AD 326, established the earliest temples in Hangzhou. Unfortunately, only Lingyin Temple has survived from the five temples he founded. The construction of temples and pagodas culminated in the 10th century when the Qian family governed the area and made Hangzhou capital of the Wuyue Kingdom (AD 907-978). There were about 200 temples in the city back then and a great part were built or renovated by Qian Liu, the founding king and his successors. The Qians also built the Leifeng Pagoda and Baochu Pagoda at the West Lake. Taoism started to prosper around this time. And Geling Hill is believed to be the place where Ge Hong, the Eastern Jin (AD 317-420) Taoist scholar and alchemist, attempted to produce pills of immortality. Wushan Hill and Yuhuang Hill gradually rose to prominence in the mid-17th century, as many Taoist temples became established in the area around this time. Shanghai Daily recommends an outing to the hills around the West Lake, where both religions established themselves, and take a spiritual journey. Listed as one of the new “Ten Scenes of the West Lake,” Wushan Hill is arguably more loved by locals than tourists and visitors. It is set in an ideal location, overseeing the West Lake to the west, Qiantang River to the south and the residential neighborhood to the north. The iconic Chenghuang Tower is the best vantage point to get a clear view of everything below. The 41.6-meter tower is modeled after the architectural styles of Yuan (1271-1368) and Ming Dynasty (1368-1644) buildings. The walls of the first and the second floors display civil life during the Southern Song Dynasty (1127-1279), while the best viewing spot can be found on the fourth floor. The tower is part of the Town God Temple, which is a tradition in Taoism to enshrine venerable local government officials as the city’s guards. The “God” worshipped here is Zhou Xin, who was a top officer in charge of litigation in Zhejiang during the 15th century. Other temples in Wushan include the Wugong Temple, which worships Wu Zixu, who was a loyal general more than 2,400 years ago. There is also a temple that reveres the “God of Medicine” and a shrine commemorating the Qing Dynasty Zhejiang governor Ruan Yuan. The Buddhist grottoes inside Baocheng Temple are a must-see for every visitor. The sculptures of Mahakala, and the two Bodhisattvas sitting beside it, were built in 1322. They are symbols of the prevalence of Tibetan Buddhism among the Yuan imperial court back then. Situated on the north bank of the West Lake, Baoshi Hill is known for the red rocks that cover the slope of the hill. They sparkle like precious stones (baoshi) inlaid in the evening sunlight. And that’s where the name comes from. There are several staircase pathways that ascend the hill, which takes on average 40 minutes to climb. The Sunrise Observation Pavilion is the best place to take a panorama of the West Lake. The Broken Bridge to the south, the slowly moving boats and the lush islands dotted around the lake are breathtaking. The pavilion is said to be a tribute to the alchemist Ge Hong. Not far from the pavilion is a well, which is believed to be the place where Ge used to keep his pills. It is now protected as part of the Baopu Taoist Temple. Seen from the Bai Causeway, at the other side of the West Lake, the Baochu Pagoda, erected on the hill, is probably the most iconic structure in Hangzhou’s skyline. The hexagonal brick tower was built to protect Qian Chu, the last king of Wuyue, who decided to surrender his kingdom to the Northern Song Dynasty (960-1127) in AD 978. 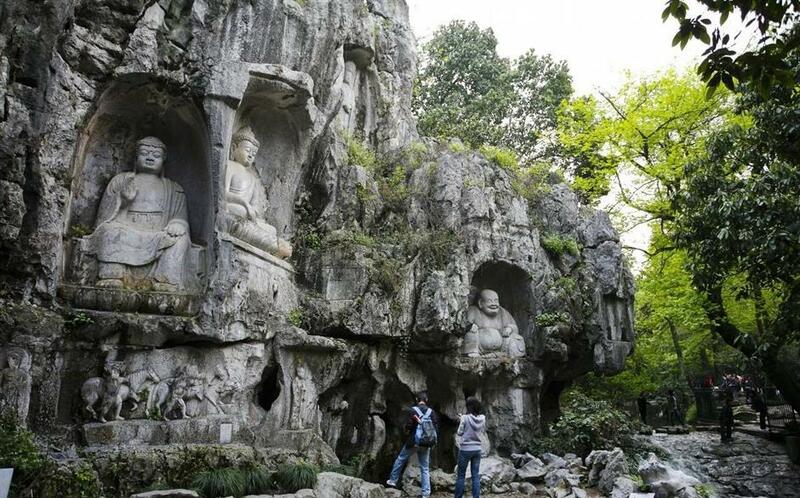 Along a lesser-known pathway, on Baochu Road, 20 caves of Yuan and Ming Dynasty Buddhist grottoes are a view to behold. The carving sculptures are not very well maintained however, most were badly damaged in the 1960s. The seventh and eighth caves are the only two recognizable, as a sitting Bodhisattva and a monk carrying two containers on his shoulders. The Lingyin Mountains refer to several peaks west of the West Lake. The 300-meter Beigao Peak is the highest in the urban area of Hangzhou and attracts many hikers because of its steep slopes. Buddhism believers from several dynasties have built over 300 statues, with the oldest dating back to AD 951. The laughing Maitreya is the most widely publicized grotto among them all. It is carved in the image of a Budai monk, who is seen as an incarnation of the Buddha, with his characteristic exposed big belly and a ring of Buddha prayer beads in his left hand. A few steps along, from Lingyin Temple, is Taoguang Temple, which is built into the cliffs of Beigao Peak. It is a sacred site for both Taoism and Buddhism. The last hall of the temple worships Lu Dongbing, one of the “Eight Immortals” in China’s folklore legends. Emperor Qianlong was mesmerized by its tranquility and sophistication. In his six travels to the Jiangnan area (south of the lower reaches of the Yangtze River), he visited the temple eight times. He wrote more than a dozen poems complimenting the views seen at Taoguang. A stone tablet unearthed in the 1950s keeps a clear record of the delightful times he spent here. 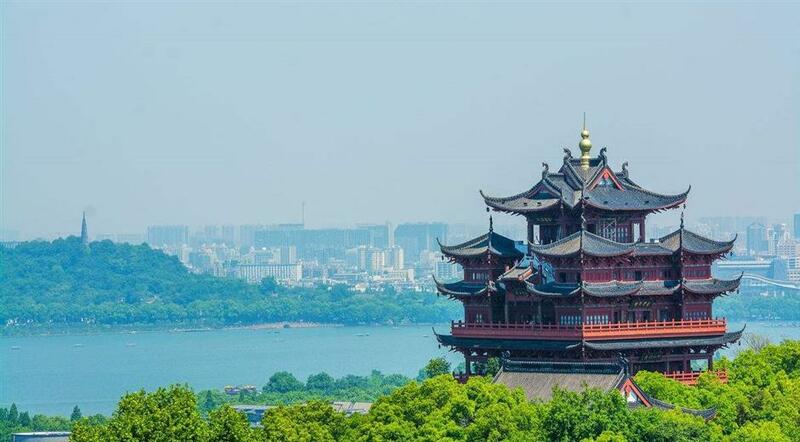 The Guanhai Tower is the highest spot in the temple and makes a perfect viewing platform to overlook Hangzhou. If visibility is good you can see Qiantang River from afar and its outstanding tidal bores.